Haverford’s Andrew Bostick is the force behind the school’s new student-run garden. Printed in: The English House Gazette, Bryn Mawr College, Bryn Mawr, PA, November 16, 2010. “It’s really nice to get outside and to actually interact with the soil,” said Andrew Bostick, a junior at Haverford College and one of the founders of its student-run garden. Bostick, who is double majoring in English and Economics with a minor in French, is not the type of person you’d expect to be planting seeds in the middle of winter and harvesting fresh vegetables for a summer internship. And yet, this tall, slim, 21-year-old from Bernardsville, N.J. has spent the past two summers gardening and researching the feasibility of sustainable agriculture.He has also spearheaded a successful effort to establish a student garden on Haverford’s campus.The garden is now entering its second season and there is talk of expansion. Bostick said in an interview that he was never interested in sustainability or gardening before he came to Haverford.”I never really thought about environmentalism or anything like that,” he said. In the book, Pollen makes the case that the current way Americans eat and their reliance on fast food is unsustainable and is harming the environment. 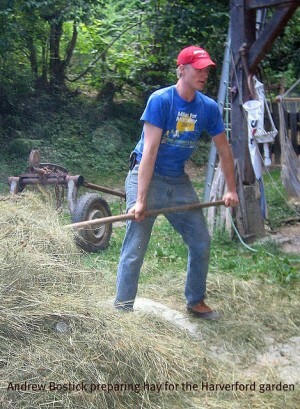 Inspired by Pollen’s arguments, Bostick applied for a grant from HaverfordCollege‘s Center for Peace and Global Citizenship (CPGC).He got the grant and with it he went to France the summer after his freshman year to study the differences between organic gardening and farming in France and the United States. In the fall of 2009, he and a handful of other students, who had also completed CPGC agricultural internships that summer, started to plan a small student garden.According to their blog, they wanted to bring awareness of food-justice issues to the Haverford campus. “At Haverford we spend so much time reading and writing papers,” Bostick said.The group wanted to emphasize the benefits of getting out and working with the earth.”It’s a different kind of learning,” he said. Through the fall and winter, Bostick and the other students worked together to improve their plan and secure a location and funding.The students received a grant from the CPGC for the project and started preparing land near the Haverford College Apartments. The garden had a fruitful summer season.Bostick received funding from the CPGC to stay at Haverford over the summer to organize the many student volunteers and oversee the garden project.Under his leadership, students harvested many vegetables and herbs throughout the summer and into the fall. In addition to organizing the summer work, Bostick was tasked with writing a proposal for permanent funding and finding a better location for the garden.He submitted his proposal to several groups on campus including the President’s Office, Students’ Council, and the CPGC.The fruits of his efforts paid off and the Haverford Garden Initiative now receives money from all three groups. The Initiative will use some of that money to build raised beds in the garden.Raised beds will help keep the soil moist and aerated during next year’s season. There is also talk of relocating the garden to a different location on campus, which has better soil.The current plan for the 2011 growing season, Bostick said, is to maintain the existing garden and grow plants that need a lot of space in the new location. Another result of Bostick’s proposal is that the CPGC will fund another intern next summer.The CPGC will also pay for students to work five hours a week in the garden next semester, he said. For Bostick, “sustainability is about thinking about the ways in which we live, that effect other people whether we see it or not.”He thinks on a global scale and is aware that his actions effect people around the world. “I’ll always be someone who gardens,” he said, “and I like the idea of introducing others to gardening.”He does not know if his career will directly relate to agriculture or sustainability, but he is hopeful that after he graduates he will continue to do social-justice-related work. “How Does Your Garden Grow?” originally appeared in the English House Gazette, a news blog for Haverford and Bryn Mawr College students. Used with permission. The original article can be viewed here.